If you live in the vicinity of Canada’s capital region and are aspiring to become a language professional, you’re in for a treat. For starters, the cities of Gatineau and Ottawa and their surrounding areas are home to most federal government departments. Localities on either side of the Ottawa River have municipal administrations and provincial offices. In short, the federal capital region’s main industry is none other than the government. This bodes well for language professionals of all stripes, namely editors, translators, interpreters and writers, to name but a few. With the help of these individuals, written and oral communications are effectively transmitted to the public in either official language. 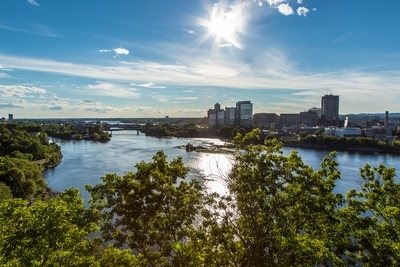 According to Emploi-Québec’s labour market website, the IMT, approximately 80 per cent of editors in the Outaouais administrative area work full time. Not surprisingly, most editors are women (about 75 per cent). All of the editors in this area are between the ages of 25 and 54. Some editors work in closely related fields such as publishing, interpretation, terminology or translation. Given that Canada’s official languages abound in the federal capital region, it is certainly possible to work exclusively in English in Quebec. Mary Metcalfe is an English editor and writer who lives about 90 minutes east of Gatineau. She has no difficulty finding work in English — 95 per cent of her work comes from outside Quebec. Her main client is based in Victoria, B.C. With the help of the Internet, she has clients in Montreal, the United States and England. When asked about common difficulties in English editing, Metcalfe makes mention of “wild and wacky translations of copy” in both official languages. Earlier this fall, she saw a French flyer on a store counter followed by an English translation. “The English was terrible,” she said. Word to the wise: Avoid taking the cheap route. Don’t use online translators. And I add this: Hire an editor. Nestled between Montreal, the New England states and Quebec City and area, the Eastern Townships (also known as Estrie in administrative circles) are home to a small hub of language professionals. Like in the Outaouais, most editors in the Townships are women (80 per cent). Many editors work full time as well. Emploi-Québec’s IMT observes that, unlike western Quebec, 40 per cent of Townships editors are 55 years of age or older. In terms of clients’ geographical locations, three-quarters of Delli-Colli’s clients are in Sherbrooke; about a quarter are in nearby localities. Approximately two-thirds of Lépine’s clients work outside the Townships. Considering the Townships are near the United States, Lépine notes that some Sherbrooke-based clients don’t need to hire English editors or translators because their English proficiency is sufficient to pass muster. “If you’re an anglophone, you should hire a professional francophone translator/reviser when you want to produce solid texts in French. Only then will you be in a position to suggest that your clients do the same, only in the other direction,” he concludes. Eastern Townships/Cantons-de-l’Est Official Tourist Guide 2014–2015, 9. Tourisme Québec, 2014. CSSS-IUGS = Centre de santé et services sociaux — Institut universitaire de gériatrie de Sherbrooke, or Sherbrooke’s Health and Social Services Centre and University Institute of Geriatrics.